I was reading over a list of historic events that happened on this date, and was reminded that on October 12, 1997, John Denver died when his small, experimental plane crashed into Monterey Bay in California. I’ve always enjoyed John Denver's music. In fact, one of my daughters is named Darcy, taken from a beautiful song titled "Darcy Farrow" on a 1970's John Denver album. I was smitten with that name from the first time I heard it. The reason I bring this up is because when John Denver comes to mind, I'm reminded of how he received a "snub" of painful proportions. In January of 1985, to raise money to help end hunger in Africa, a group of American singers gathered and recorded a song called "We Are the World". I'm sure you remember the song and video.... it was a huge success. Not only did it raise money and awareness for Africans, it won Grammys in 1985 for Song of the Year and Record of the Year. Those participating were a Who's Who of America's popular singers: Harry Belafonte, Ray Charles, Stevie Wonder, Bruce Springsteen, Michael Jackson, Billy Joel, Paul Simon, Tina Turner, Hall & Oats, Dionne Warwick, Bette Midler, James Ingram, Diana Ross, Willie Nelson, Kenny Rogers, Cyndi Lauper, Smokey Robinson, Bob Dylan, Lionel Richie and many others. Even Dan Aykroyd was there! But John Denver..... who probably put more effort into solving world hunger than any artist, ever..... wasn't asked to be there. John called himself a "concerned citizen of the earth". He was asked to serve on the Presidential Commission on World and Domestic Hunger. He was one of the founders of The Hunger Project, an organization committed to the sustainable end of chronic hunger. 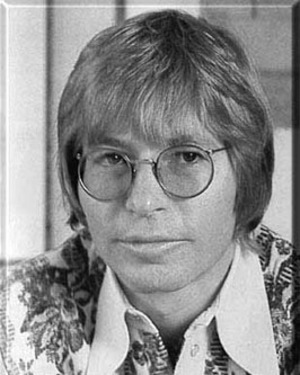 John Denver toured African countries devastated by drought and starvation as a representative of UNICEF. He performed benefit concerts for global hunger and environmental efforts, and was even awarded the Presidential "World Without Hunger" award. Yet, astonishingly, he was not even invited to participate in that "We Are the World" campaign. And from what I read, it was not an oversight. It was probably because the popularity and sales of his records had slipped during the 1980's. In his 1994 autobiography "Take Me Home", John wrote, "It broke my heart not to be included...."
Today, I was just thinking, he should have been there. I, too, always wondered what really drove that train? Despite John Denver's charitable and socially conscious nature, he wasn't included. Just wonder how many who did participate, either worked for such a cause before the event; even worse, how many of them never did another thing for humanity? I've often wondered why he wasn't asked too. Who was the individual/company responsible for getting the musicans together? Maybe there was a hidden agenda or personal vendetta. I agree too. John Denver should have been able to sing on we are the world.He helped try to feed the hunger and tour countries like Africa. He had just as much talent as the rest, if not even more talent. I'm sorry to hear it broke his heart not to be included, But in my opinion - He was WAY out of their league. I'm sure he was busy that day - probably feeding the hungry instead of just singing about it. Were there ANY Country or Folk Legends there?? Many great talents were Not included While many two-bit, so-called artists were...Go Figure..I Never really thought much of that whole endeaver anyway..They are full of themselves, But the world remains hungry. John was a concert for humanity all by himself, perhaps there was no room for him there as his wonderful spirit was just too big for the space.